This mini speaker adopts advanced BT 4.2+EDR technology, and the transmission distance is up to 10m, you can easily connect with almost all BT-enabled devices. Equipped with 3-Watt 40-mm horn, combined with independent cavity design, so that the music of the high and low frequencies are thick, clear and undistorted. 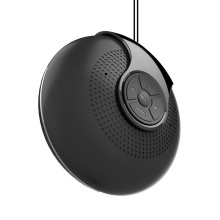 You can conveniently answer calls by this BT speaker when in the bathroom, at home or office, anywhere and anytime when it is connected to your smartphones. It flashes colorful RGB-LED lights in working status, which looks beautiful and fashionable, illuminates the surroundings at night. With super mini size, you can easily hold it with your palm or hang it on your bag. Revolving design makes it a good toy to play, add more fun to your life. Adopts advanced BT 4.2+EDR technology, the transmission distance is up to 10m, you can easily connect with almost all BT-enabled devices. Equipped with 3-Watt 40-mm horn, combined with independent cavity design, so that the music of the high and low frequencies are thick, clear and undistorted. You can conveniently answer calls by this BT speaker when in the bathroom, at home or office, anywhere and anytime when it is connected to your smartphones. It flashes colorful RGB-LED lights in working status, which looks beautiful and fashionable, illuminates the surroundings at night. With super mini size, you can easily hold it with your palm or hang it on your bag. Revolving design makes it a good toy to play, add more fun to your life.